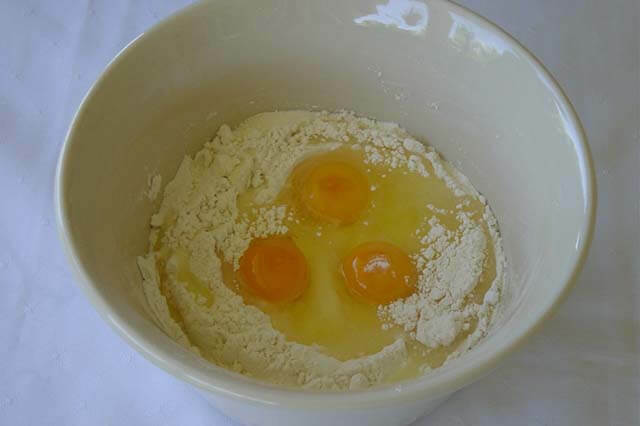 In a large bowl combine flour, salt, eggs and sufficient liquid to form a soft dough. If using tofu, half mix and add liquid. Mixture should be of a very firm batter consistency. Too hard and they come out small, too runny and the spaetzle pour through the holes. Comes with practice but you will learn. Try small batchs at first and you can thin it down or thicken with a little extra flour, until it is right. Rinse the Spaetzle Maker in cold water and place on top of pot. Pour half the mixture on to the Spaetzle Maker. Using the plastic paddle spread the mixture back and forth through the holes into the simmering water. If mixture is very easy to spread, it is the right consistency. If the mixture is too thin, you will end up with spaghetti spaetzle.